New from Nature Boy Designs is a patch to protect your favorite fishing hat from the fly drying space it inevitably becomes. 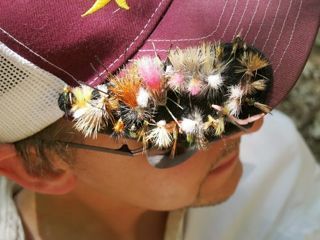 Put your flies in your patch instead of ruining your favorite lid! The Hat(ch) Patch contains a low profile, durable foam that fits on most all baseball hats. Keep your flies close at hand and simplify your fishing system. It can easily be taken on and off and keep you looking fishy when you want or when you don’t. Designed and manufactured in the USA by Keith (Nature Boy) himself!